Sweet, spicy, sour, and savory: for every taste, there's a beautiful design to draw the crowds to your tastiest events. 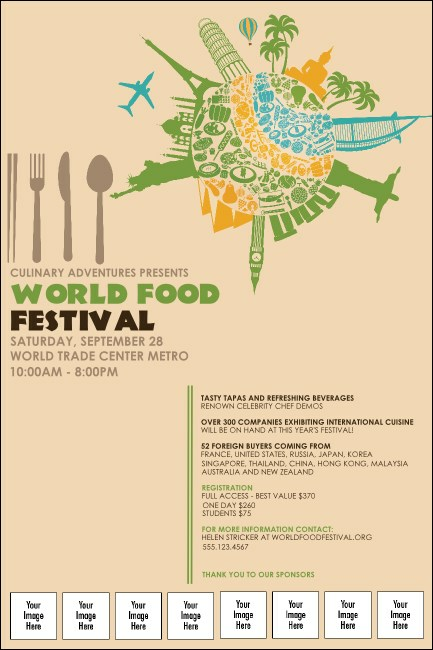 For international cuisine, this Food Festival Poster is a perfect accompaniment. Turn up the heat on your pre-event sales with the heavenly aroma of exciting advertising and season with custom image uploads. Slice it, dice it, and spice it with TicketPrinting.com.